Timzguida Ouftas. Powered by Blogger. One of the best ways of checking how to get to Morocco is through the website www.skyscanner.net. Check for flights to Agadir, which is the closest airport to the surf town of Taghazout (40 minutes drive away) where are accommodation is based. You can also fly to Marrakech, however it is 3 hours 30 minutes drive to Taghazout, so we recommend the quicker option of Taghazout if it is available. Once you've landed on the hot Moroccan soil of Agadir there are a variety of options as to how to reach your surf destination of Taghazout. A direct transfer to Berbere Surf House which will cost you 300dh (which is approximately £25/€30) each way and bookable on site. Drop us an email to arrange this transfer. A private taxi from the airport to Paradis Plage accommodation will cost about 400dh (approximately £30/€35) each way. Please email us with your flight times so we can arrange your taxi. Alternatively, share a taxi or minibus transfer through our shuttle bus parter A2B. If you fancy having that extra bit of freedom during your stay, hire a car from our hire car partners Hertz as there isn't a car hire company in Taghazout itself. If you're looking for a powerful wave, then Killers is spot on. This forceful righthand pointbreak wraps itself around the headland near Taghazout, and works best when there is bigger swells. This break can handle good size... anything from 4 feet to double overhead, so when it gets big enjoy watching the pros ride the super long wave (anything up to 500metres). Another amazing right hand point break, Anchor Point is renowned for its perfect lines and thigh burning long rides. Where Killers will catch most swells, Anchor Point works best on a medium longer lasting swell, and will offer steep take offs, seemingly endless rides, and even some cover ups thanks to the sand banks on the rock reef seabed. For the baby brother of Anchor Point, head to the south of Taghazout and surf Panoramas. Yet another right hand point break... Panoramas works with a smaller swell to Anchor Point or Killers, so will start working at about 3 feet and will provide easy rides. At the North end of Taghazout lies Hash's Point, perfect for anyone staying at our Surf Berbere surf house accommodation as it is literally in front of where you are! It is an easy wave, especially as it's so close to where you can stay. It works best on a mid to high tide, and provides yet more righthand rides towards the centre of town. For anyone looking to learn to surf, Devil's Rock is ideal as it has punchy lefts and rights, so will suit you regardless of whether you are a goofy or natural with your footstance. It's also that little bit kinder to feet with its sandy bottom, so if taking part in a beginners surf camp, you'll often find yourself enjoying the waves and then the fish kebabs at the beach restaurant after. A surf trip to Morocco is a truly unique experience, and like its European counterparts, the coastal areas offer spectacular long white sandy beaches and endless surf options, not just for high-level surfers after leg burning rides at Anchor Point, but beginner surfers who are also looking to get amongst Morocco’s green Atlantic walls. It is Morocco's mix of culture, geographical location, old world history, the people and the awesome beginner waves that offer the perfect canvas for a surf holiday abroad. The beaches in this article offer an excellent platform for a first experience amongst the salt and will give you the ideal conditions to master the basics. Before long you’ll be trimming along the green part of the wave and whipping in some turns and cutbacks on the Morocco surf holiday. 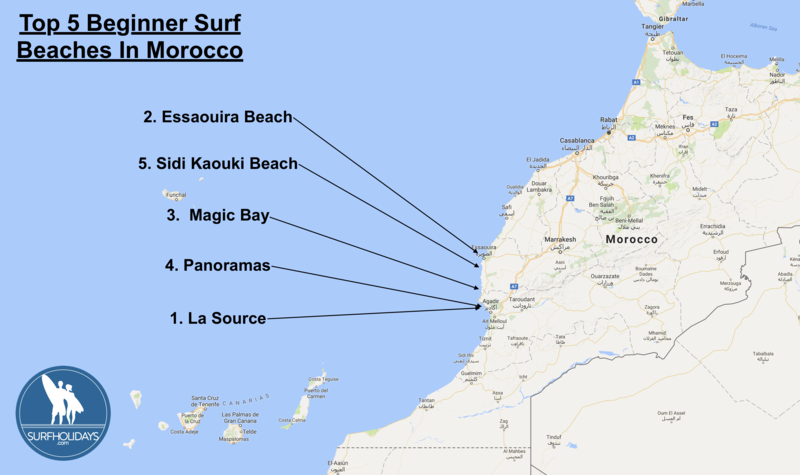 Below you will find the top five beginner surf beaches in Morocco. La Source provides performance walls and a high lifting A-frame that walls up slowly, making it perfect for beginner surfers on a Morocco surf trip. On the push of a small swell, the right-handers hold up towards the cliffs, while the rarer lefts break out towards the beach section. Small reef sections combine with the sandy bottom to provide nice walls that can offer some speed sections. The Area: Taghazout, and its neighbouring town of Tamraght, are small bustling towns full of cafés, surf shops and interesting local stores. It is a very safe area that has for years embraced the surf culture of foreign travelling surfers. Beach: Beautiful golden sand beach which gets its name from the fresh water springs bubbling up from onshore rock formations. Type: Right, and the occasional left-hand, walls that peel perfectly through the bay. It is rarely busy which is what you want out of the best beginner surf beaches in Morocco. This is one of the best-kept secrets for people on a Morocco surf camp because Magic Bay is a long right-hander that can break for up to 600m when the conditions align, making it one of the longest waves in Africa. Imagine a mellow Skeleton Bay that has been flipped around, and you’ll get the picture! The Area: A surf holiday in Imsouane will usually involve all day surf sessions, a trip to Agadir and its world famous Souk. In addition to an afternoon swimming in the beautiful natural pools at Paradise Valley and evenings chilling out watching the spectacular sunset from the roof tops of your accommodation, whilst eating tagine and sipping on fresh mint tea. Beach: Mountainous cliffs slope down to a calm bay that has a long and pointy headland that the right-hand walls wrap around and then peels down the sandy bay. A must visit for any surfer, regardless of ability. Type: A beginner and long-boarders heaven, a super slow walling right-hander that just seems to go on and on. The only challenge is how long your legs can hold up! A fantastic beginner beach break that is often overlooked for the more famous Morocco surf spots. Panoramas produces some good barrels, and to top it off is less crowded than some other breaks. When there is a huge swell rolling in, the sheltered beach break is a safe place for beginners to learn. The Area: Taghazout is a chilled out surfer’s paradise that is full of cafés, local stores and restaurants serving traditional Moroccan cuisine. Beach: A long expanse of beach with a headland to the north that offers shelter. A fantastic option to spend the day, relaxing in the tree shade, taking in the views of this beautiful beach. I’ve never surfed before. I am a complete novice. Can I come for a lesson? Yes. Aftas Surf lessons are available for the novice all the way through to intermediate surfer. You do not need ANY previous experience and if you have had lessons before that’s ok too. I don’t know how to swim. Can I still come for a lesson? No. The minimum requirement is that students are able to swim at least 50m un-assisted in a swimming pool. Yes. If you’ve already learned the basics, our instructors at Aftas Surf i can assess your current level and then help you improve your skills. We can help take your surfing where you want to take it. A towel, your own swim wear, sun protection, and any medication you may personally require (i.e. inhalers/insulin injections). We provide all your surfing equipment. What is suitable swim wear? Any clothing which is designed for marine sports. It should be comfortable, flexible and light weight. What is Stand Up Paddle (SUP) surfing? This is a sport using a large surfboard ( 10ft) which you stand on and propel yourself forward using a large paddle. Do you do Stand Up Paddle board lessons? How much do they cost? Yes. We teach SUP as private or couples lessons. These lessons do not depend on waves so they can be done any day/time of the week. Just give us a call to book. Private lessons cost € 30 and couples lessons cost € 35 p/person. Can you fix my surfboard? How much will it cost and how long will it take? Yes. Aftas Surf offer a repair service. The cost of the repair depends on the damage and varies between each case. The duration of the repair will also depend on the extent of the damage and how busy we are. I’m new to Agadir and want to know where I can hang out with local surfers? You will normally find local surfers around the beach during most of the surf season. Whether there are waves or not you’ll see plenty of people at the beach swimming or on Stand Up Paddle boards. Aftas Surf also hold ‘surf socials’ once a month during the surf season. Check the website news page and facebook group for details on the next up coming social. Do you sell surfboard fins? Yes. Just give us a call. Do you give windsurfing lessons? My son is 9 years old. Is he eligible for a surf lesson? Do you do surf birthday parties for children? Yes. Just send us an email (agadirf@gmail.com) with the following details: Number and age of children, date and time, and any special requests. When does the season start and finish? How often do you get surf ? The surf season starts in October and finishes in May with the peak months being December to February. During the peak months you can expect approx 15 days of surf per month. There is an average of 99 days of surf per season. How Big does the surf get ? The largest surf recorded in Tamraght was 3.5 meters. Average conditions are 2-3 foot the peak months (December, January, and February) frequently seeing days of 4-5 foot surf. 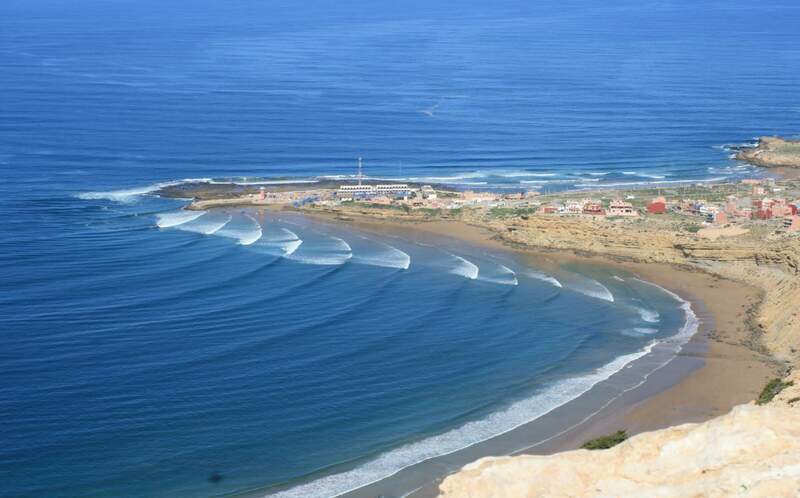 Do you do surf trips to Imsouane and mirlfer ? How long is the drive and how much does it cost? Yes! We do trips down to Imsouane and other secret spots during the summer months from May – August. The drive takes 2 hours and the cost varies on each trip depending on numbers. The average cost is about 150 € including food, transport, camping supplies, and surf guiding. See the facebook group and photos page of this website for pictures of previous trips. Do you sell bodyboards or skimboards? We sell skimboards but we do not sell bodyboards. Can I buy a package of surf lessons? Of Course! All instructors are fully qualified lifeguards certified by the Australian and British Surfing Association (BSA). Safety is our first and foremost priority. None that are going to harm you! You will not find any dangerous sharks because the waters are too warm for them. How cold does the sea get in winter, do I need a wetsuit all year round? The coldest the water gets in Agadir is about 20 degrees. During the cooler months a wetsuit is recommended. A 3-2mm thickness will keep you very warm whilst some may even prefer just a thermal top. However, most of the year it’s boardies weather.